Before going house hunting, you can request that your lender preapprove your loan — not just prequalify it. Loan preapproval requires a few more up-front documentation from you and takes a little more time initially. 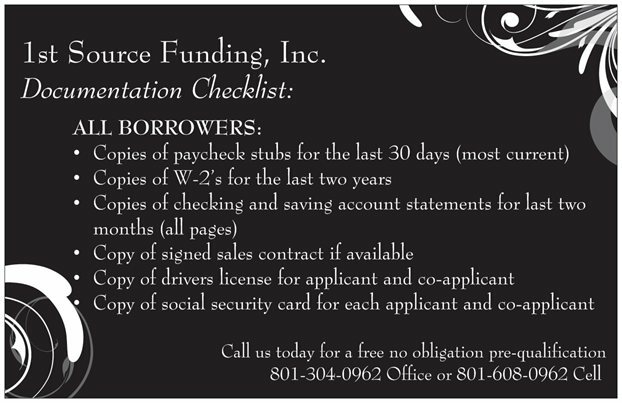 You can undergo this process with ease with the guidence of one of our Loan Specialist at 1st Source Funding, Inc. It requires the lender's underwriter (the person responsible for saying “yes” or “no”) to issue an approval subject to finding an acceptable house and meeting a number of conditions. A seller’s real estate agent understands that an offer with a preapproved loan is farther along in the loan process than a prequalified loan and may take the preapproved offer more seriously. Our loan officer requires you to complete a mortgage application before anything else happens. This application requires you to disclose your name, addresses for the last two years, birth date, Social Security number, and work history for the last two years, as well as information about your finances. Preapprovals require credit reports for all borrowers. The loan officer uses the information provided on the mortgage application to obtain a credit report with all three credit bureaus. This report is analyzed by the lender's underwriter to ensure that the credit guidelines are met and includes the credit scores. Credit score requirements depend on the mortgage program applied for. The lender also looks at your payment history and checks to see if there are any major credit issues. Recent bankruptcy, foreclosure, and unpaid tax liens are reasons to decline a loan. If you're employed, the lender requires recent pay stubs and W-2s for the most recent one or two years. The lenders calculate your base income and determine if any overtime, bonus, or commissions can be used to qualify for the loan. Lenders may also require a two-year history of receiving commissions, overtime, or bonuses before that income can be used to prequalify for the loan. Self-employed borrowers or borrowers with rental property who claim any unreimbursed business expenses may be required to provide tax returns for one or two years. Many types of non-employment income, such as interest and dividends, retirement income, and Social Security income, also require tax returns. If you own a company that files corporate tax returns, you may have to provide any corporate returns, including any K-1s, income documents like a W-2 or 1099 issued to you if your company is a partnership or S-Corporation. You will be required to provide documentation of where the down payment would be coming from. The most common sources of documentation are bank statements and investment statements. Many lenders do not allow cash on hand (or money kept outside of a banking institution) to be used for a down payment or closing costs. When a family member, company, or nonprofit is giving you a gift or grant for the down payment, you may be required to provide a gift letter and proof that the donor has the funds to give. Usually a one-month bank statement is required. Our Loan Specialists help you through the process of buying a home with ease. We're dedicated to providing seamless real estate financing, making it our goal to provide our customers with the support and personal attention they deserve. Our exceptional staff will lead you through all steps while helping you achieve and maintain comfort and confidence throughout the process. It is important to work with a lender you can trust, we specialize in connecting buyers with the right financing. The loan officer for the mortgage company will be required to provide you with documentation when you apply for a preapproval. The loan officer will provide you with a Good-Faith-Estimate, or GFE. This document explains the costs and terms of the loan you have applied and been approved for. You'll also be provided a copy of your application and disclosures, including notification of your right to a copy of the appraisal, servicing disclosure statement, and the initial disclosures to submit your mortgage application to the lender. The loan officer has three business days from your application to provide you with a GFE. for questions about our mortgage services and how we can assist you on your home loan.